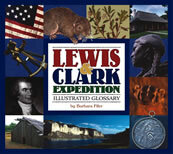 Description: Did the Lewis and Clark Expedition really feast on anchovies and pheasants? How many beads were in a brace? What kinds of rifles did the men use? Who are the Pahkee Indians? And whatever is an espontoon or a circumferentor? This is a quick aid to enjoying the journals kept during 1803 to 1806, with text and illustrations. Covered are terms no longer commonly used, tools, clothing, wildlife new to Expedition members, Indian nations met (and their actual names, compared to what the Corps thought they were called), brief biographies of Expedition members, significant geographical features, and more. 80 pages, 8 1/8" x 9 1/8". Softbound.